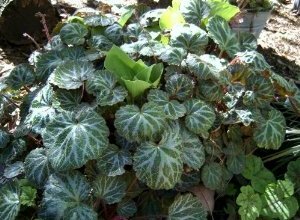 Strawberry Begonia grows in a mound of rounded, scalloped leaves with decorative silvery veins. The leaves are hairy with burgundy-red undersides. Its most charming feature, though, are the long runners with plantlets dangling from the plant. Display it in a hanging basket to show them off. In its native habitats of China and Japan, S. stolonifera grows as a groundcover, spreading quickly by its runners that readily take root. This plant likes cool temperatures, but is frost-tender. Keep it cool and moist, and it makes an easy-care house plant. 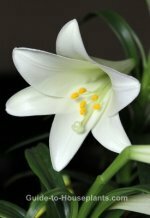 Sprays of tiny, white star-shaped flowers on tall stems may appear in summer. You can encourage more flowers by allowing a cool, dry rest for a few weeks in winter. Repot in spring every couple years or when the roots fill the pot. Put it in a hanging pot to show off its trailing plantlets. Use a pot with drainage holes to prevent soggy soil. Direct sun can cause leaves to look faded or brown. 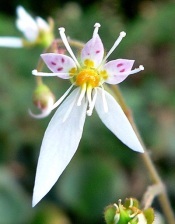 Keep Saxifraga stolonifera out of strong summer sun. Crispy, shriveled leaves are often a sign that the air is too dry. Use a pebble tray or a room humidifier to raise the humidity around the plant. Don't mist this plant because the tiny hairs trap water and may cause the leaves to rot. Dry soil could also cause dry leaves. Aim to keep the soil lightly moist. Winter Care. Give this evergreen plant a dry, cool rest in winter. Keep it in a cool (50-55°F/10-13°C) place, and water sparingly, but don't allow the soil to dry out. It'll suffer in the dry air caused by central heating. Use a humidity tray or room humidifier, if necessary to raise the moisture in the air around it. Watch for an invasion of spider mites that are attracted to dry conditions. Buying Tip: A few varieties are available. 'Tricolor' has small, green leaves with creamy yellow margins and red undersides. Rare variegated varieties exist with dark-green leaves edged in creamy white. Did you know...This plant is neither a strawberry nor a begonia. Its common name comes from the rounded leaves that look like begonia, and because it spreads by runners like a strawberry plant. Strawberry Begonia is in the Saxifragaceae family, along with Piggyback Plant. What these two have in common besides attractive foliage is a trailing habit and their ability to produce plantlets that are easily propagated. Height: Up to 8 in (20 cm); runners trail to 12 in (30 cm) or more. Light: Bright light year-round. Some direct morning sun is fine, but shade from strong sun, which can cause leaves to fade. Water: Water thoroughly and allow the top inch (2.5 cm) of soil to dry between waterings. Water less in winter, when growth is slower. Overwatering can lead to root rot or crown rot and may cause fungus. Humidity: 40-50% relative humidity. Use a pebble tray or a cool-mist humidifier if air is dry. Soil: Any good potting mix. Fertilizer: Feed monthly in spring and summer with a balanced liquid fertilizer diluted by half. Propagation: Propagating is easy to do from runners. Place small pots around the parent plant. Leave the runners attached and, using a bent paper clip, hold plantlets down into moist potting mix. The plantlets will quickly form roots. After 3 weeks, you can cut the runners to detach them from the parent plant.